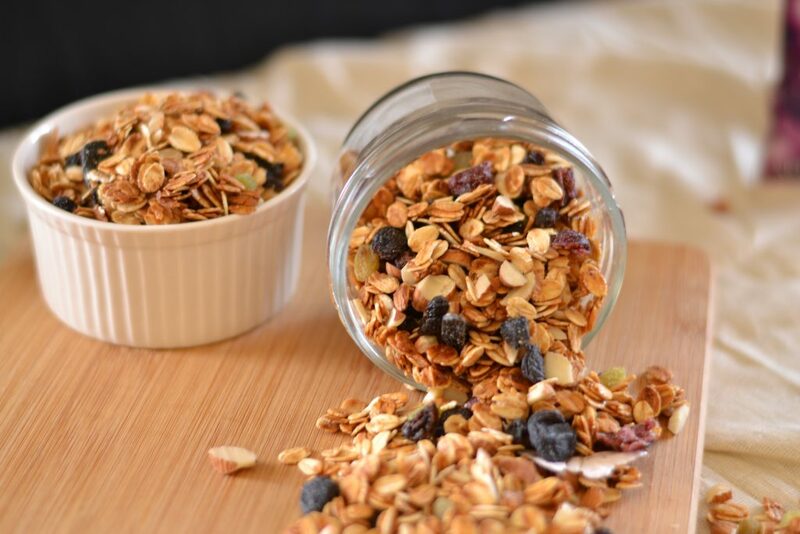 Granola brings to mind the sweet sticky bowls of cereals, which has gained popularity in recent times, due to our latest health freak attitudes and an easy pick for a busy lifestyle. But the major mistake I had been doing till recently, was to buy my cereals and granola, until, I decided to experiment with my grains, seeds and make my own granola. There were times when SM, would care freely pick granola and energy bars for his Sunday long runs and happily chew on them for quick energy. 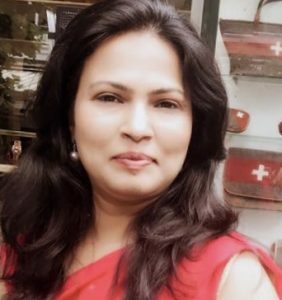 I realise the commercial versions are loaded with unwanted sweeteners and are exorbitantly priced due to a fancy quotient, more than the health benefits they bring. But eventally the habit of getting to the finer prints and details of processed food, we consume at home, made me come to a conclusion, that its high time I must start my own granola section in kitchen. 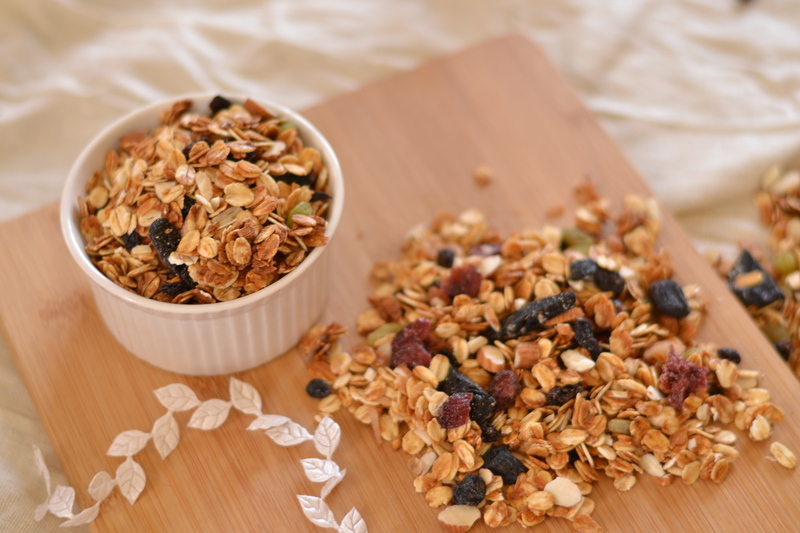 Oats are easily available, and I have used the rolled oats which gives a better texture and crunch to the granola. A farm sourced honey is used, and honey is a quick source of energy. But if u are diabetic or wanna reduce the calorie intake, I suggest to avoid it, but be prepared for the changed look of the granola. As far as the nuts are concerned, I like to keep it simple, with few at a time in a batch. So i used Almonds, Raisins, Prunes( as I had some lying in the pantry ) and black currants. Feel free to experiment keeping the quantity in check. I bet after U make it Once u will be addicted to make it always and have it handy for that anytime hunger and energy surge needs. 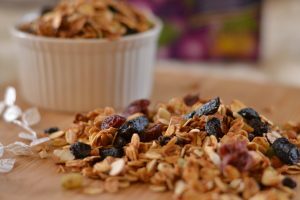 A toasted Granola made of rolled oats and combination of Dried berries and Nuts, which can be added to your breakfast bowls, or has just like that. Take the rolled oats and spread them on a baking tray lined with Butter paper. Switch off the oven and allow the granola to cool down. Now add the berries and toss. I like to use pure, self-sourced honey to be sure about the quality. 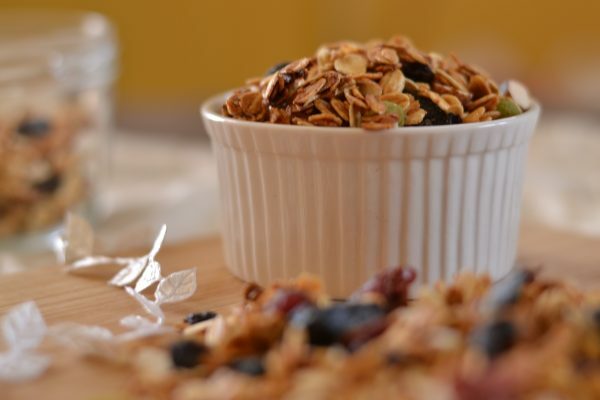 Also, there are several things which can be added to the granola, but I like to have several combinations for a taste variation, instead of adding everything to one. Add whole nuts or chop them as u wish. I have used Prunes, black currants, raisins and almonds for this recipe.